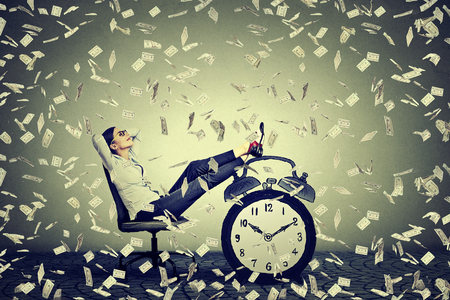 Time is money, as the saying goes in the business world, so how rich are you? Running a business is incredibly complex and it is certainly not something that can be done half-heartedly. Not only do you have the day-to-day running of the business to focus on, you also have to oversee your employees, perform your managerial duties, and try to streamline your company and keep essential costs to a minimum. In order to help you figure out an effective cost management plan, you may wish to consider opting for a daily time sheet and implementing time tracking software into your business. Being able to manage your time effectively is a gift that should never be under-estimated, yet sadly, business owners and employees alike, often do exactly that. Failing to manage your time effectively is potentially costing your business thousands of dollars. Most frustratingly of all is the fact that this unnecessary waste of money can easily be avoided. This is one of the main reasons why more and more businesses are opting for time tracking in the form of a daily time sheet. Here’s a look at how time tracking software can help with your cost management plan. In the business world, technology is advancing at an astonishing rate. More and more businesses are becoming increasingly reliant on smart tech and cloud technology, and they are reaping the rewards as a result. By implementing timesheet reporting software as part of your business structure, you too can benefit hugely. You see, by opting for something as simple as a daily time sheet, your workforce can utilize cloud tech so everybody knows exactly where they stand. If for example an employee is working on a project with a two week deadline, by tracking their time they can see exactly how far along they are so nothing is left to chance. If they were out of the office at the weekend, without time tracking software they wouldn’t be able to see how far ahead, or behind, of schedule they were, until they got back to work on Monday morning. With a proper time tracking solution however, they can simply log in via their smart phone or tablet from anywhere, at any time. This in turn means that nothing is left to chance. Remember, a project that is incomplete when the deadline arrives is likely to result in an unhappy client, not to mention the fact that resources could be wasted unnecessarily by putting more people on said project in a bid to meet the deadline. With a daily time sheet however, employees can monitor their progress at any time, from anywhere. In a working environment, transparency is vital. Transparency means that nothing is left to chance, and it takes guess work out of the equation. Rather than dealing with ‘what ifs’ you instead deal with the facts. By utilizing a daily time sheet in the form of time tracking software, you help to promote transparency. If a client has requested an update on a project your company is working on, rather than guessing, or having to explain that you’re not entirely sure how far along you actually are, you can give them a clear and definitive answer. This is very good business practice because not only do you as a business owner know where you stand, more importantly your client also knows where they stand. Keeping your clients in the loop by giving them clear and definitive updates is almost certainly going to keep them happy, and as you know, a happy customer is far more likely to be a returning customer. In terms of a cost management plan, the benefits of a regular and happy client are obvious for all to see. Another great reason to consider utilizing time tracking software as part of your business model, is because it makes it much easier to bill for time. If you’re trying to keep your costs down, a daily time sheet could prove extremely useful. Say for example, you sometimes hire freelancers, as they may not be on-site, you may not always know exactly how much time they have spent on which specific projects. As they’re not in the office said freelancers may sometimes guestimate the hours they have worked and will often round up the figure slightly. 10 minutes here, and 5 minutes there may sound like nothing, but over a month this can really add up. With a good time tracking solution in place however, when billing you they can give you accurate and precise figures so you can pay them for the exact amount of time they spent working for you. When it comes to figuring out a cost management plan, another fantastic reason to implement time tracking software as part of your business overhaul is because it allows to make better use of your resources. As mentioned, a timesheet routine promotes transparency, so you can see exactly how far along each employee is when working on a specific task. This therefore helps you to utilize resources accordingly. If for example, you can see that two employees are working on a task that ordinarily only requires one individual, you can re-assign them to a more pressing task that may require more than one person. Not only that, but you can see which resources are being utilized properly, and where. This helps hugely when it comes to keeping costs low, because you know exactly where your employees should be assigned, so you can prioritize. If you can see that an employee is struggling to handle their workload by themselves, you can assign them an extra pair of hands. Another very handy advantage associated with utilizing a daily time sheet is the simple fact that it helps to avoid distractions. This goes not only for your employees, but for you as well. You see, when you utilize time tracking tech, it helps to promote focus and motivation because people are aware that they are being monitored. Employees know that their employers will have access to their timesheets and so they are obligated to do the work that they are paid to do. Let’s face it, in an office environment it’s not difficult to find something distracting that may take your attention away from the work that you are performing. There are other employees, there’s social media, and there are more trivial, less-pressing tasks that people may sometimes work on. Time tracking software helps to reveal the purpose of the activity being performed, so employees can see whether they are on schedule, or falling behind, and whether they are focusing on the right things. Let’s face it, there are some businesses out there that expect a little too much of their employees, and sadly they work them too hard and set them unrealistic goals and objectives. Ultimately when employees fail to meet these goals and targets because they are over-worked and under-resourced, it ends up costing the company money. Now, as you’re trying to figure out an effective cost management plan, this is the last thing you will want to happen. Time tracking therefore once again proves incredibly beneficial for employers and employees alike. In this instance, it isn’t simply a case of an employee claiming to be overworked where it is essentially their word against their employer’s, they will now have concrete proof on-screen that they physically cannot manage their current workload by themselves and that they therefore require assistance. For project managers and employers, this is very useful because it ensures that they set their employees realistic targets and goals rather than asking too much of them. Not only does this help the business financially, it also helps to keep employee morale high, which in itself is hugely, hugely important. Remember, a business is only as strong as its weakest employee so if morale is low, this can really have a knock-on effect for your company. Finally, as if the above wasn’t enough to help convince you that time tracking is the right thing for your business, how about the fact that time tracking helps you to analyze and monitor data. With something as basic as a daily time sheet, you can see how much time was spent on each specific project for that particular month, and you can then simply compare the results with data from previous months. This helps give you a clear and concise oversight of your business as you can see where employees are productive, where assistance may be beneficial, and where you can potentially make cutbacks and savings on company resources. The more you know about the ins and outs of your business, the better it will be for all involved. Therefore, if you’re still hesitant to utilize time tracking software in your business, hopefully this will be enough to sway your decision.